it just can't get any better than this. This year I have found a new love. It's Cloches. The First Cloche Party in April I didn't own a Cloche. Now, nine months later I have a few. But, I'm on a merry Cloche hunt. I have made some and have been given some. 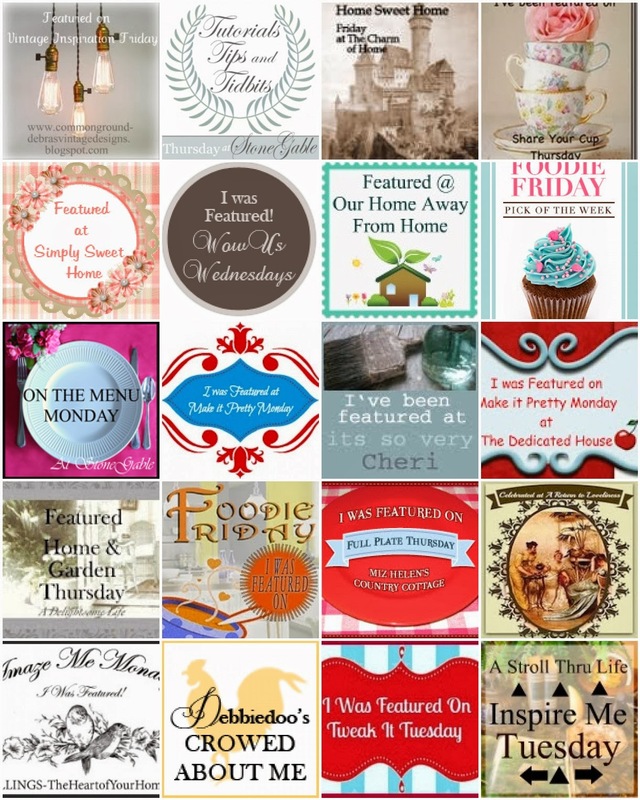 I think I have a good start for the new year and the inspiration I get from visiting the wonderful blogs I know next year's Cloche Parties will be even more fun to join. 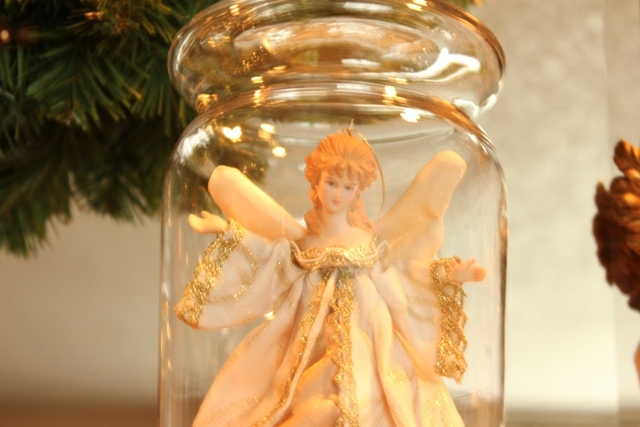 As you know I collect Angel ornaments for my Christmas tree. 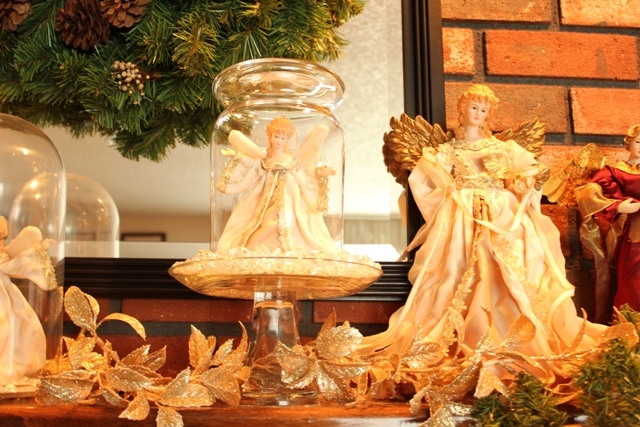 Well I collect bigger Angels for my Mantel and I have a big beautiful surprise next week. Are you guessing now? 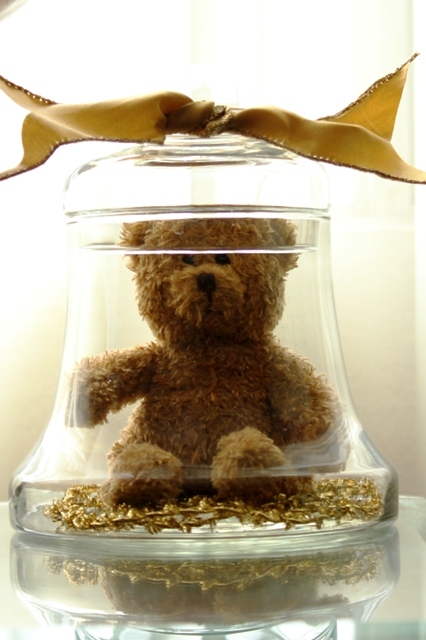 Doesn't everyone have a cute little bear in a Cloche? 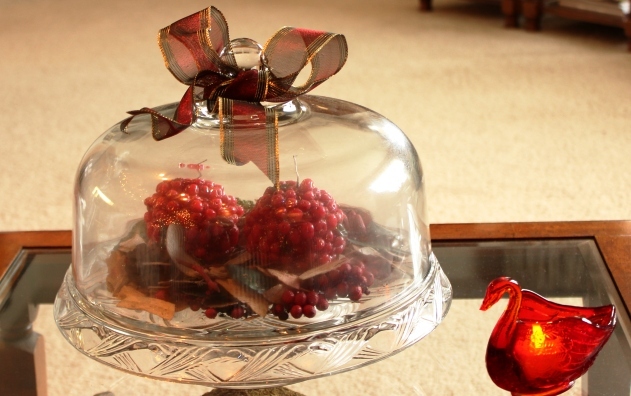 Some Potpourri and red berry candles in a covered cake plate. 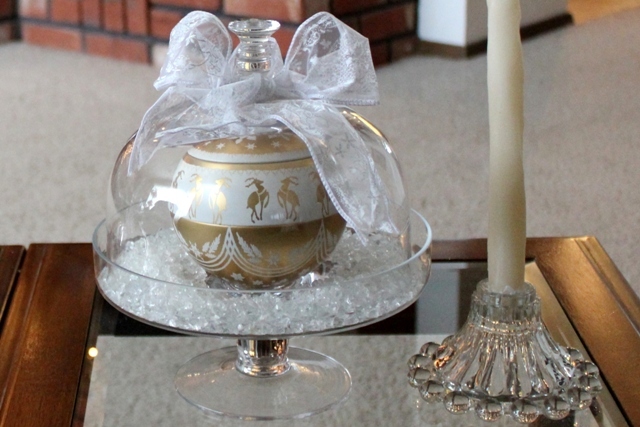 A beautiful Cloche with a gold ornament and white ribbon. Maybe more white is on the table. 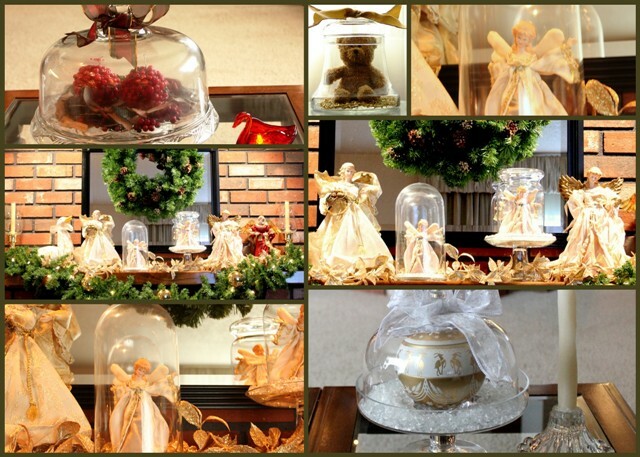 I think this Cloche would look great with a few Christmas cookies in it or maybe a cupcake. Oh!! Some more white. I love my vintage Candlewick candle holder. 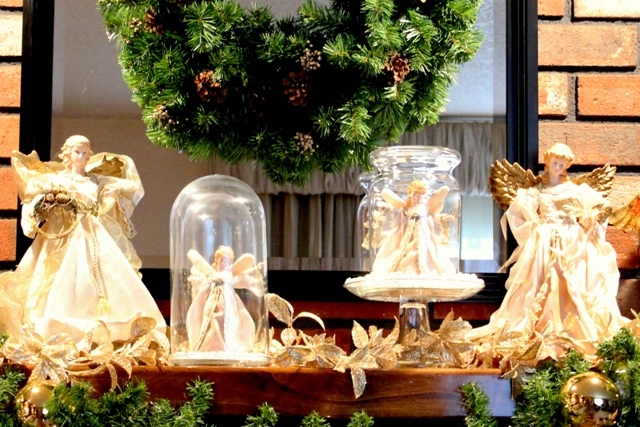 The two Angels in the Cloches are twins. 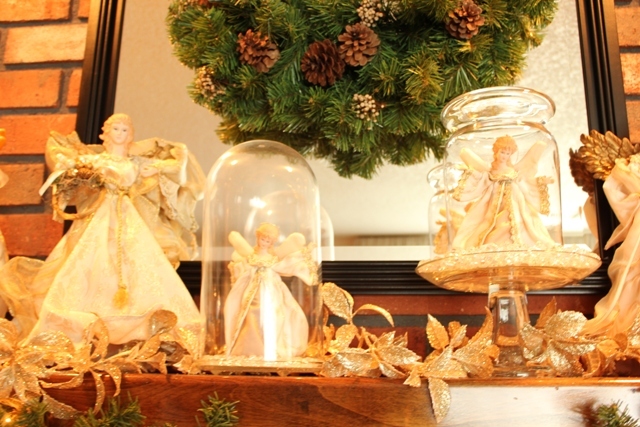 The large Angel in the next photo is their mother. This is my living room. We have a wood burning fireplace and burn wood all winter long. It's so cozy. Now you know where My Cozy Corner is. Thank you for visiting me today and please come back soon. 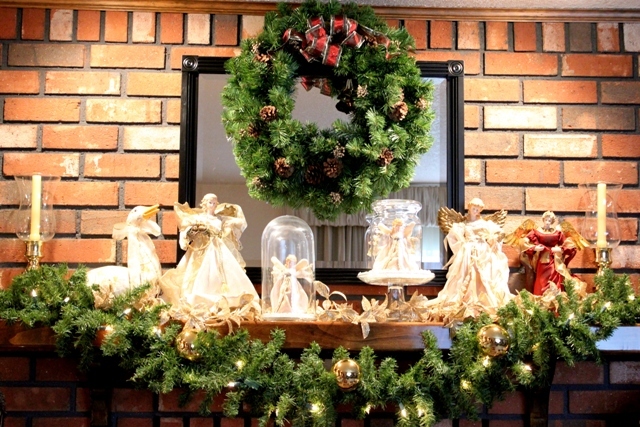 Please link back to these amazing blogs for more wonderful Holiday Cheer. Absolutely gorgeous… Happy Cloché Party & enjoy the week-end. 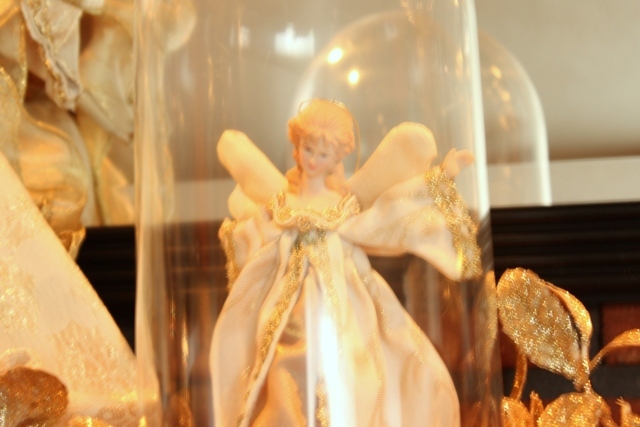 Love your cloches and nothing is prettier than an angel!! the cloches are gorgeous. who knew of such a thing as a cloche party? you are right-it just doesn't get much better! 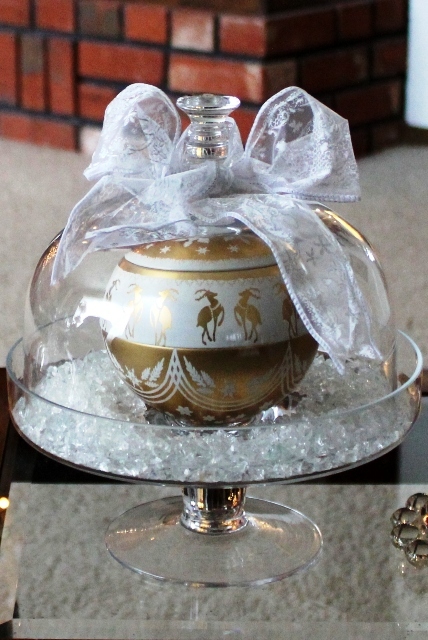 What a beautiful way to set off that pretty gold ornament. Beautiful displays! Hi Betty! 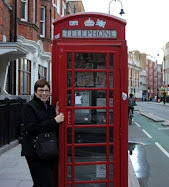 I didn't even know they were called cloches until I started blogging! :-) I love yours and they are just glowing and lovely. 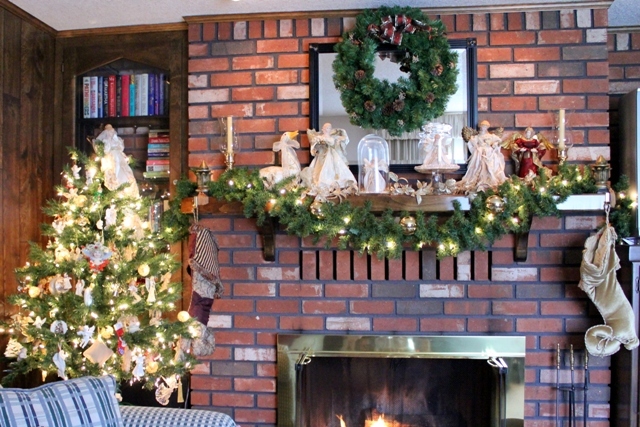 Your brick fireplace is wonderful too. 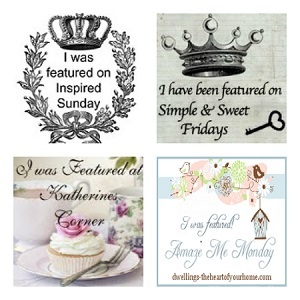 Thanks so much for joining Inspiration Friday this week! Happy Pink Saturday! God Bless you and keep you safe ....slow down and enjoy the season...don't forget it is Jesus who shine the brightest for us all...love the angels! The bear in the cloche is the best! I am off to hunt up my own bear for display, thanks for the idea. Very pretty cloches! I especially love the teddy bear one but they are all lovely! Happy Pink Saturday. The teddy bear is so sweet! It's all so beautiful! Love all of your varied cloches. I just didn't get there this year. Thanks so much for sharing them with Seasonal Sundays. 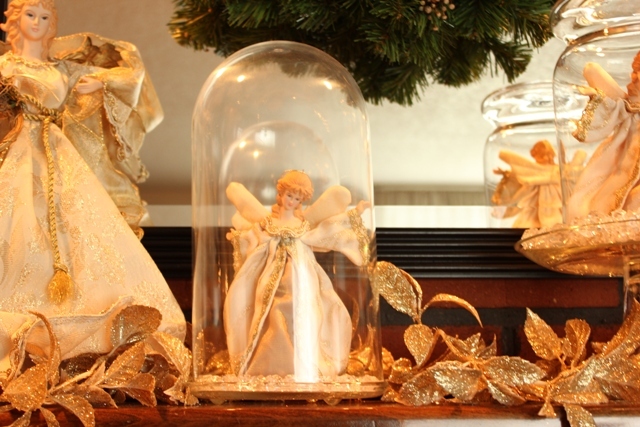 Your cloches and other decorations are so lovely! Yes, now I know where your cozy corner is! Very pretty, I love the big gold ornament.